Sometimes the best gifts in life come to us in unusual ways. So it was with my dear friend Mats Lederhausen's recent birthday. Aptly named a "former wunderkind" by Reuters.com, Mats was turning fifty, and as a celebratory gesture of this milestone, he and his wife Jessica decided to host a party. Not just any party, mind you, as this one served to expand the worldview of all who attended - most of all my own. "We weren't even sure that this time a party was what we wanted," the invitation read. "But then we realized that it is a good idea to stop and pause for a minute. To appreciate all the gifts life has given us and to collectively celebrate the magic and wonder of life itself." I vividly remember a Friday afternoon where I shared how struck I was by Mat's unique and gracious solicitation to his friends with another good friend, Adam Hanft. Adam was equally moved, and he quickly zeroed in on Mats' particular use of the word pause. It was a synchronicity, I thought, as I had been working with 'pause' as a bigger concept - weaving it into the work I do around how people work. I believe that unless we effectively pause, we cannot elevate our behavior. In so many ways, pausing enables better decisions, greater consciousness of the impact of our actions on others, and a more meaningful existence. Take a step back for a moment and consider this big picture: the majority of Americans feel seriously busy. Being over-worked, overwhelmed and double-booked is the new normal. Our schedules not only tend to get ahead of us, they can often overtake us - leaving the majority of people feeling as if life is something happening to them, not something they are consciously and purposefully directing. The 'busy' feeling is now a collective human experience and an intrinsic part of who we are and how we live. It was not always like this. Up until the Industrial Revolution, mankind moved in time with nature's pace. For millennia, the cycle of life on earth was directed by the passing of the seasons. All living things - plant, animal and human - waxed and waned with the movements of the moon and other celestial bodies. In spring, we flourished. In winter, we waited. We paused. Whether by way of hibernation, dormancy or the like, we slowed down, became still and rejuvenated ourselves. In doing so, we and other species were able to emerge stronger than before. Ralph Waldo Emerson once said: "in each pause, I hear the call." In the spirit of his birthday, this was precisely what Mats was asking us to do - to pull back from the frenzy of everyday existence, pause and hear the call. Mats' birthday invitation went on to request a special "gift" from a handful of guests, myself included. He didn't want wine, the latest gadget or even a charity donation in his name. That would have been too easy. Instead Mats asked for an "electrifying TED Talk." It turns out that we would be taking part in a highly produced "Purpose Summit" - complete with an auditorium, lights, cameras, a live audience made up of Mats' friends from around the world, with Mats himself serving as officiating host. Leading up to the event, Mats went so far as to circulate the TED speaking guidelines and conduct dry rehearsals in the spirit of proper preparation. In short, he wasn't fooling around. Needless to say, some folks were nervous. I admit to feeling a touch more performance anxiety than I recently experienced addressing the United Nations. As a pioneer of purpose-driven business, Mats is one of the deeper thinkers I know. He's a man whose purpose in life is to lead a purposeful life, and to inspire other people and organizations to do the same. Blow him away? I knew I needed to bring my 'A' game. I decided to run with the pausing concept, going steps deeper than I had before. On its own, I believe pausing is an idea well worth spreading, particularly in our increasingly interdependent world. It has a deeply philosophical and restorative quality to it. Furthermore, personally, it resonates with the ethos that I've built my company around: the notion that how we do anything means everything. My talk touched on all of these qualities, articulating my belief that pausing may be a key to our ability to survive and thrive in business and beyond. Pausing may be central to the ability to open up our minds and rethink the way we think and relate. It may help millions of people to see things anew. At the very least, pausing is one of the simplest and most powerful tools we have to connect with ourselves and move forward in a more deliberate, purposeful and inspired way. Today, two years after Mats' birthday party, I continue to tinker with this powerful concept. My latest endeavor is a collaboration with the 92nd Street Y. 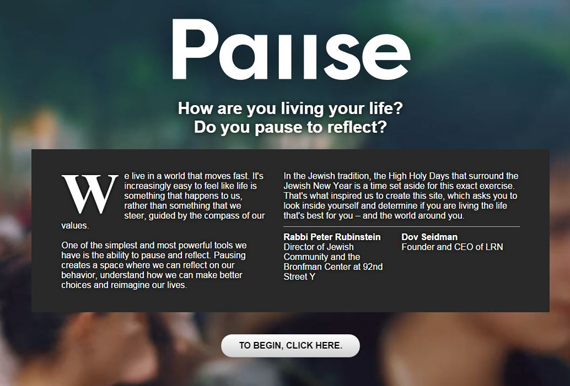 Our organizations came together to develop GivingPause, an online tool to help people pause and reflect on their values, and on the consequences of their behavior. As GivingPause is still in experimental mode, we would love to hear your thoughts and personal experiences in the comments section below. My hypothesis is that once we've reconnected to the principles of conduct we hold dear, we can spread those shared values throughout our communities and organizations, helping to create a culture that encourages doing the right things, not just getting things done right. Along these lines, Mats' fiftieth birthday presented me with more than an experience. It was an opportunity to elevate my thinking and to more deeply reflect on the right things to do - both in that moment and on into the future. In this way, his requested "TED Talk" was every bit as much a gift for me as it was for him. My greatest hope is that GivingPause will offer others a similar reward.